Stacy is a litigation attorney and received her Bachelor of Science in Criminal Justice from Long Island University, where she was selected for Who’s Who Among American Colleges and Universities. She earned her Juris Doctorate degree from New England School of Law in Boston and commenced her legal career when she worked with Citizen's Energy Corporation in their Contract Department. Upon graduating from law school, Stacy began her practice in Maplewood, New Jersey where she was a partner with Fish & Benson. Afterwards, she opened her own practice and concentrated her legal practice in personal injury. Her present affiliation with Barry and Albert now enables her to development her legal expertise across any aspects of the legal field. 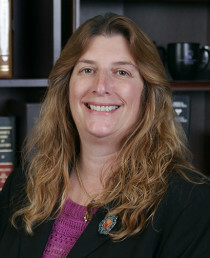 She is a member of the New Jersey Bar and has been practicing since 1989, with a focus on litigating personal injury matters, including Automobile, Slip and Fall, Worker’s Compensation, subrogation claims and commercial litigation claims. She also handles all aspects of Wills and Probate, Family Law, including Divorce, Post Judgment Motions, Name Changes and Guardianships, as well as all aspects of Real Estate Law. She is also a licensed mediator and arbitrator wherein she decides both Commercial and Personal Injury matters for the court system. Stacy has also been an adjunct professor at Raritan Valley Community College. She has extensive trial and related litigation experience and appears in all courts throughout New Jersey, and has also appeared in the Appellate Division. She handles both plaintiff and defense litigation, which allows her to efficiently and fully understand and evaluate each and every claim. Over the last 25 years, Ms. Benson has been trial counsel on numerous matters and has been a pivotal force in litigating and defending matters for various insurance carriers and individuals. Stacy would be happy to speak with you. Please give Stacy a call today.